Orbis Terrarum Veteribus Cogniti Typus Geographicus - JANSSONIUS,J. 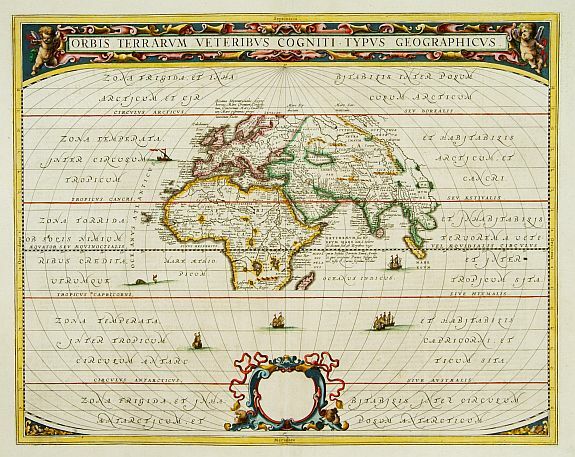 Title : Orbis Terrarum Veteribus Cogniti Typus Geographicus. Size : 16.1 x 20.1 inches. / 41.0 x 51.0 cm. Description :A classic map of the ancient world based on Ortelius. Europe, Asia and Africa as far south as Madagascar are placed at the center of a much larger oval frame. The Climatic zones are marked. The title is enclosed in a strapwork panel at top.